Moscow is disturbed by the continuing extreme anti-Russian campaign seen unfolding in the United States, the Russian Foreign Ministry said in a statement Friday. MOSCOW (Sputnik) – The ministry cited certain individuals, dubbing them “the knights of the Cold War,” like retired General Robert Scales who in March publicly made a call “to kill Russians,” and the former NATO forces commander, Wesley Clark, who a few days ago in Washington used the scary “Russian threat” to demand the immediate delivery of lethal weapons to Kiev to use against the people in eastern Ukraine. Moscow slammed US national news agencies and leading political centers for demonizing Russia. Wesley Clark also avertly commended the followers of Stepan Bandera, a Ukrainian WWII nationalist, the Ministry underscored. The statement emphasizes that the rhetoric of US russophobic warmongers "outshines" the official representatives of the country. 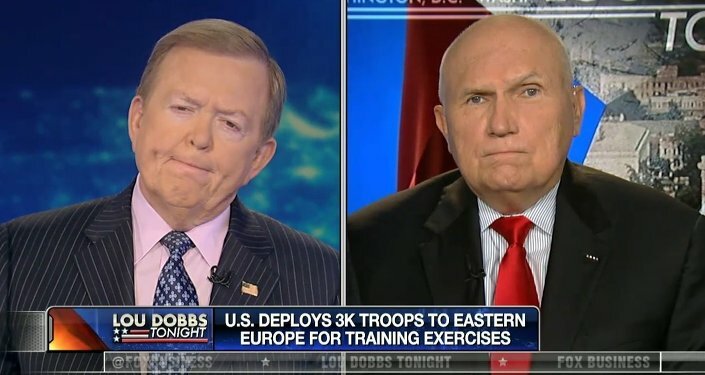 "Well-matched for the retired American-NATO general, praising Hitler supporters, US Deputy Secretary of State A. Blinken called the assertion of the right to speak Russian 'the linguistic nationalism of Russia'. This means, Russians and Russian-speaking residents of other countries, including Ukraine, are guilty merely of speaking and thinking in Russian". The relations between Moscow and Washington deteriorated significantly in 2014 after Crimea voted to reunite with Russia and Kiev launched a military operation in the Ukraine's southeast. The United States imposed sanctions against Russia over Moscow's alleged role in Ukrainian conflict – a claim Russia repeatedly denied. The US Congress has authorized $10 million for 2015 to promote alternative Russian-language broadcasts in Ukraine and other Eastern European countries to counter what it refers to as "Russian propaganda." Early in March US Assistant Secretary of State for European Affairs Victoria Nuland said that the Broadcasting Board of Governors (BBG), an independent federal agency of the US government supervising all government-supported civilian international media, will spend another $23 million on Russian language broadcasting.